Is Licorice Candy Good for You? The benefits of licorice candy depend on the type you’re eating. Red licorice candy never contains actual licorice root from the licorice plant, and black licorice seldom does so. 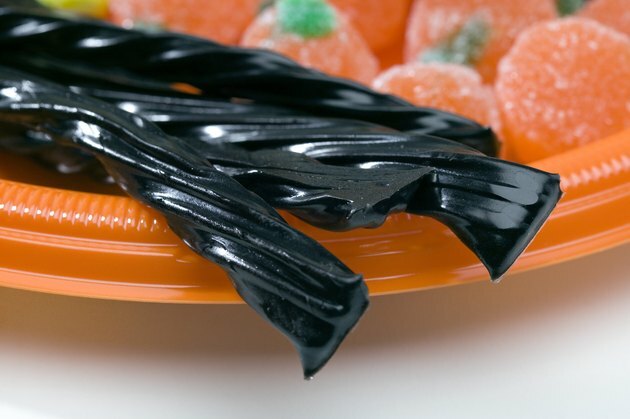 Most licorice candy consists of refined sugar and food coloring and has no health benefits at all, other than serving as a quick source of energy. Black licorice made from real licorice can have health benefits but also has significant health risks. Talk to your doctor before consuming large amounts of real licorice or taking licorice supplements. Real licorice candy contains glycyrrhizin, a substance obtained from the root of the licorice plant. Very little licorice candy manufactured in the United States contains glycyrrhizin, although licorice candy from other parts of the world may. Manufacturers can remove glycyrrhizin from licorice, creating a product called deglycyrrhizinated licorice, or DGL, which may also have some health benefits, research studies have not conclusively established this. Licorice has a long history of use in Eastern and Western medicine to treat stomach problems such as peptic ulcers and indigestion. Whole licorice may help with sore throats, upper respiratory infections and cancer sores in the mouth. Whole licorice may also have weight-loss benefits and, when used as a cream, may help heal the skin rash eczema. None of these benefits have been conclusively proven, although some have shown promise in limited clinical trials. A Japanese study reported in the August 2009 issue of “Obesity Research and Clinical Practice” found that subjects taking 300, 600 or 900 mg daily doses of licorice flavonoid oil over eight weeks lost more body fat than those taking placebo. Subjects taking 900 mg per day also had significant decreases in body weight, low-density lipoprotein, the “bad” cholesterol and visceral fat. A 1979 animal study published in the “Scandinavian Journal of Gastroenterology” showed a decrease in ulcer in rats given DGL with aspirin. Taking or consuming real licorice that contains glycyrrhizin for more than two weeks can cause pseudoaldosteronism, which increases your sensitivity to a hormone produced by the adrenal glands. This disorder can raise your blood pressure and cause fluid retention and potassium loss. Do not take real licorice if you have a history of heart problems or high blood pressure. Licorice may also reduce testosterone levels in men and may have estrogenic properties that could cause harm if you have a history of estrogen-dependent tumors such as breast or uterine cancer. Since licorice could induce premature labor, do not take real licorice product while pregnant. Can Pregnant Women Eat Black Licorice? What Are the Health Benefits of Glycyrrhiza glabra? Is Black Licorice a Laxative?